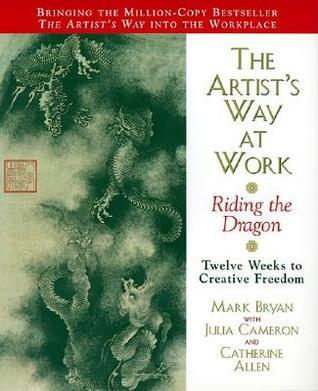 I have not yet read Julia Cameron's "The Artist's Way". And I happened to borrow "The Artist's Way at Work" from the library. After renewing it twice, I realized this is a book I must own, a book I reference over and over.... I've already shared some of the exercises with a client and seen amazing results (the Affirmations + the Blurts). I am very familiar with the former but the blurts put a very interesting spin ... instead of just saying the affirmation, we listen to that inner critic in his or her language and we reverse the thought. The quotations on the side of the book are a remarkable collection of beautiful, inspiring, and punchy thoughts that arouse your curiosity and awaken that creativity which is the centerpiece of the book. The Riding the Dragon concept adds a visual, a fantasy and in a way it empowers you to think and see yourself as that dragon going through awakening and transformation. I feel this is a book that truly brings out the creativity within you. I have to add that I find it very hard to apply this book to the corporate environment. I no longer am a corporate junkie but for 11+ years that was my life and I can't see how this would have been perceived anywhere but how do I really know for sure? I don't! I simply can't because I never tried ... and I feel that if I were back in that cubicle, this book might have helped me find an inner haven and perhaps helped me bring out in such a way that it might have been appreciated. I can't wait to get my hard-cover copy that I Just ordered and so I can finally return the library copy :)! If you want to tap into the creativity that lives within you, this book is for you! Hope this review was helpful. Sign into Goodreads to see if any of your friends have read The Artist's Way at Work. I found the classic Artist's Way invaluable for developing my writing and creativity in general, including tango. While I was really good about Morning Pages for the longest time, (fell off the wagon & having hard time getting back on!) I'm still working on Artist's Dates. Oh me too, I fell out my Morning Pages too but this book and all the exercises are a gem. I use it in my work with my clients too. Thanks David! I have since read and loved The Artist's Way too :)!